Tartar damages teeth and gums and affects the entire body's health. Many people mention an odor they have noticed associated with their dog's or cat's mouth when talking to their veterinarian, and often they believe this is a normal problem that really doesn't have a solution. Frequently, the putrid and distasteful smell has been around for years, and they had said nothing about it. 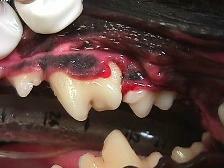 The odor the pet owner describes is the result of tartar, the yellow-brown material that collects over time around the base of an animal's teeth(above photo, large tooth), active bacteria in the tartar, and rotting particles of food lodged around the pet's damaged gums and between teeth. The pet in question has dental disease. 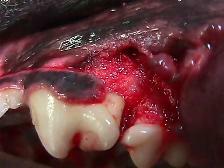 Affecting pets over two years of age most often, this is a complex and destructive oral inflammation and infection that destroys gums, bone and teeth, and in the worst case, threatens your pet's life. An offensive oral odor is a clue that dental disease is present, but foul breath is actually just the tip of the iceberg. 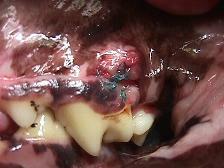 The red line above the teeth is gingivitis (infection). Look in your pet’s mouth! If the teeth have heavy brownish-yellow accumulations on them, especially near the gum line, and if the gum line is swollen and fiery red, dental disease is present. The brownish-yellow accumulation which is often greasy and very nasty in appearance is made up of plaque and tartar. Beneath those accumulations are billions of bacteria which attack the gingiva (gums) causing them to become inflamed and infected as evidenced by swelling and redness. If the situation is not corrected, the inflamed gums recede, exposing more and more of the tooth root. 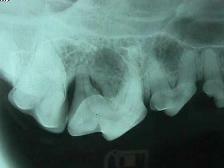 Eventually the infection destroys the bone surrounding the root and the tooth loosens in its socket. This condition can cause your pet much pain and usually makes it difficult for your pet to eat properly. Soon, the tooth will fall out. Long term dental disease and infection causes damage to other organs and body systems too. Bacteria in tartar around the teeth are a source of infection to other areas of the body. The bones of the mouth may be infected, and the heart and kidneys can also be damaged or destroyed by these bacteria circulating in the blood. At Westover Animal Hospital, we can help prevent or stop these problems before they can damage your pet's mouth irreparably. 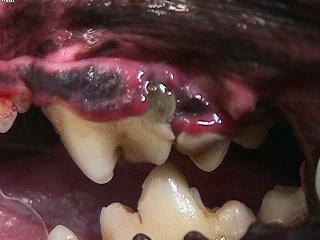 If your pet’s teeth have plaque and tartar they need to be cleaned by a veterinarian. A toothbrush will not do the job. Using an ultrasonic scaler, just as in humans, the plaque and tartar is removed from the teeth, and any other necessary dental or oral repairs are made. Major damage is often unseen and under the gums. General anesthetic is necessary for all dental procedures done at our hospital. Home dental care and diet can help slow down the return of tartar and plaque after the dental cleaning. All pets have some form of dental disease during their lifetimes. Let us examine your pet's mouth and teeth regularly for problems. We can help them and prevent unnecessary pain and damage to their teeth, resulting in a longer, healthier lives. 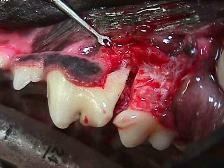 Lack of care for pets' teeth is the largest problem (my opinion) veterinarians face in pet health care today. Usually this arises because many people, including many veterinarians, do not understand the importance of dental care in the overall health maintenance of any animal, whether it be ourselves, our dogs, cats, ferrets or other small pocket pets. The situation is improving, but we still have a long way to go. Veterinarians increasing their knowledge of dental health is aiding in reducing the gap in the knowledge needed to promote far better general health in our pet population. Dental care should be begun early in any pet's life, usually at 3 to 4 months of age, and continued throughout life. 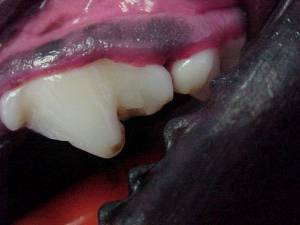 Initially, we use treated dental chews, obtained from your veterinarian, that help retard tartar formation and bacterial growth. As the years pass and the animal ages, annual dental cleanings are recommended to remove any collected tartar and damaging material that always collect aound the teeth while eating and chewing. Using dental chews throughout a pet's life is also a good policy because they will help reduce dental problems during the year and may extend the time between necessary dental procedures.